In today's fast-paced world, providing delicious home cooked meals is not always easy. Now, your busy schedule doesn't have to be compromised between time and quality when it comes to dinner. 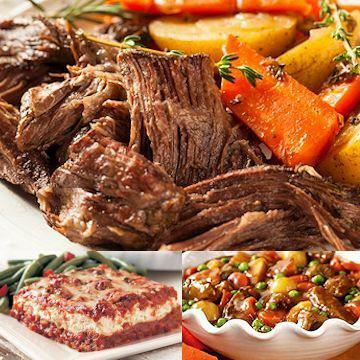 We give you an easy and affordable way to have a Sunday dinner style comfort foods delivered right to your door. When your meals arrive, just place them in your freezer and heat them when you're ready to eat! Each meal comes complete with heating instructions. �FROM THAWED: Thaw in refrigerator. Oven: Preheat oven to 400 degrees F. Remove thawed roast and juice from package and place in covered pan. Bake for 40-50 minutes. FROM FROZEN: Microwave: Place frozen roast and packaging upside down in microwave safe dish. Microwave on DEFROST for 30 minutes, turning over half way through cooking. Cut 2 small slits in packaging, microwave on high for 15-17 minutes. Remove from packaging. Slice and serve with au jus. Preparation: Do not thaw.STOVE-TOP: Preheat large pan on high. Place small amount of cooking oil in pan and add frozen vegetables. Season vegetables as desired. Stir vegetables for 7-10 minutes or until heated through. GRILL: Preheat grill on high. Remove frozen vegetables from packaging and season as desired. Place vegetables in grill pan in a single layer. Grill for 4-5 minutes stirring occasionally. Microwave (1100-WATT): Place vegetables in microwave safe covered casserole dish. Add 2 Tbsp. water. Microwave on HIGH 8-10 minutes for one half of package, 10-12 minutes for whole package, stirring vegetables after 4-5 minutes. Remove from microwave; serve. �Preparation: Do Not Thaw! Microwave (1100-WATT): Cut slit in center of film. Place tray in microwave; cook on high for 2 minutes. Carefully remove film, stir and cook on high for 30 seconds or until internal temperature reaches 165�F. Stir and serve. Oven: Preheat oven to 400�F. Carefully remove film from tray before baking. Place tray on baking sheet on oven center rack. Bake for 28 minutes or until internal temperature reaches 165�F. Remove from oven, stir and serve. Do Not Thaw! Oven: Preheat oven to 350� F.Carefully remove film from tray before baking. Place tray on cookie sheet on middle rack of oven. Bake for 45 minutes. Carefully remove from oven and stir well. Return to oven and bake for an additional 20 minutes or until internal temperature reaches 165�F. Stir and serve. Microwave: Cut slit in center of film. Microwave on high for 7 minutes. Carefully remove film and stir. Microwave on high for an additional 2 minutes, uncovered or until internal temperature reaches 165�F. Stir and serve. Ingredients: Green Beans, Carrots, Pearl Onions, Mushrooms. Ingredients: Water, Cooked Beef, Roasted Red Skin-on Potato Chunks, Carrots, Onions, Peas, Tomato Paste, Margarine (Liquid and Hydrogenated Soybean Oil, Water, Salt, Whey, Soy Lecithin, Vegetable Mono & Diglycerides, Sodium Benzoate (preservative), Citric Acid, Natural & Artificial Flavor, Beta Carotene (color), Vitamin A Palmitate added, Calciuim Disodium EDTA (to protect flavor)), Beef Base (Salt, Roasted Beef and Concentrated Beef Stock, Hydrolyzed (Corn, Gluten, Corn, Wheat, Soy) Protein, Maltodextrin, Corn Oil, Sugar, Flavor, Dried Whey, Caramel Color, Yeast Extract, Soy Lecithin, Sulfites), Modified Corn Starch, Natural Flavorings, Enriched Flour (Bleached Wheat Flour, Niacin, Reduced Iron, Thiamine Mononitrate, Riboflavin, Folic Acid), Sugar, Salt, Caramel Color, Spice. Contains: Milk, Soy and Wheat. Ingredients: Cream Cheese (Pasteurized Cream and Milk, Milk Proteins, Natural Acids, Salt, Xanthan, Carob Bean and Guar Gums), Sour Cream (Cultured Pasteurized Grade A Milk, Cream and Non Fat Milk Solids, Modified Food Starch, Sodium Tripolyphosphate, Guar Gum, Calcium Sulfate, Carrageenan and Locust Bean Gum, (Potassium Sorbate)), Sugar, Manufacturing Cream (Cream, Carrageenan), Eggs, Starch, Flour (Bleached Wheat Flour, Enriched Niacin, Reduced Iron, Thiamine Mononitrate, Riboflavin, Folic Acid, Malted Barley Flour), Powdered Milk, Vanilla, Crust (Graham Cracker (Enriched Flour, Wheat Flour, Niacin, Reduced Iron, Thiamine Mononitrate, Riboflavin, Folic Acid, High Fructose Corn Syrup, Graham Flour, Vegetable Shortening, Partially Hydrogenated Soybean and Cottonseed Oil, Water, Salt, Mono and Diglycerides, Colored with Annatto/Turmeric, Calcium Disodium, EDTA added as preservative, Artificial Flavor, Vitamin A Palmitate), Sugar, Vanilla, Cinnamon). Contains: Milk, Eggs, Wheat and Soy. Manufactured on equipment that also processes Peanuts and Tree Nuts.